A melt lake in the shape of a heart forms on the surface of the Greenland ice sheet. A tiny ravine can be seen draining some of the water away at the top of the frame. Deep crevasses break the surface of Kangerlussuaq glacier, on the south east coast of Greenland. This picture was taken from a camera fixed below a helicopter and triggered remotely. The blue colour comes from denser ice with less air bubbles inside, absorbing the red part of the colour spectrum. A meltwater ravine flowing away from the ice sheet towards the coast of Greenland. The darker colours are where silt has been displaced and mixed into the water. An opening appears on the surface of a floating ‘tongue’ at the end of Petermann glacier. The fjord water underneath acts on the glacier and causes fractures, because the ice is thinner here it starts to crack. This hole is formed due to an accumulation of cryoconite. Deposits of grit, algae and pollution blow across the surface of the ice and gather in depressions. The cryoconite will absorb more heat and melt the ice below. Slowly the deposits ‘drill’ down into the ice due to the melting action. Scientists tow a radar along the surface of this ravine using kayaks. The radar will make a scan of part of the Petermann glacier, revealing the structure below. 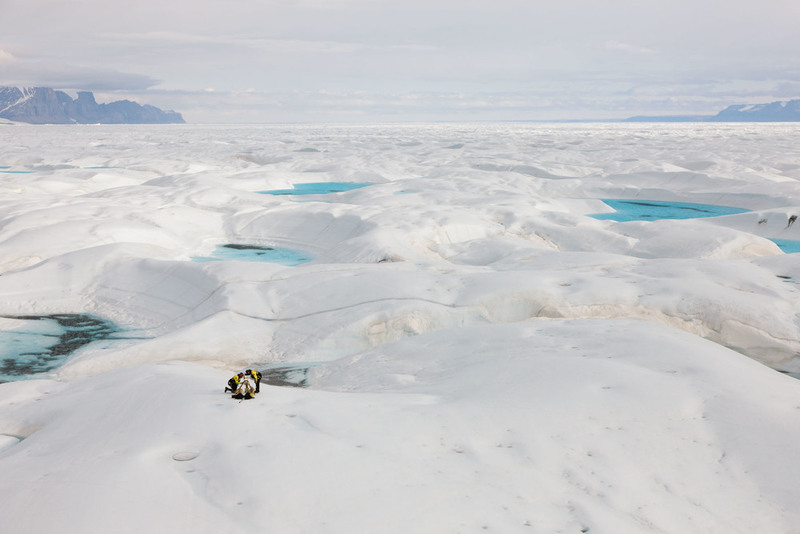 Appearing like tiny dots in this aerial photo, these two scientists are setting up a GPS unit which will transmit a position from the forward part of the glacier/ When compared with a fixed GPS point on the surrounding rock, the scientists can calculate the speed of the glacier’s movement. The ship that this expedition used as its base was moored to the glacier with a rope. 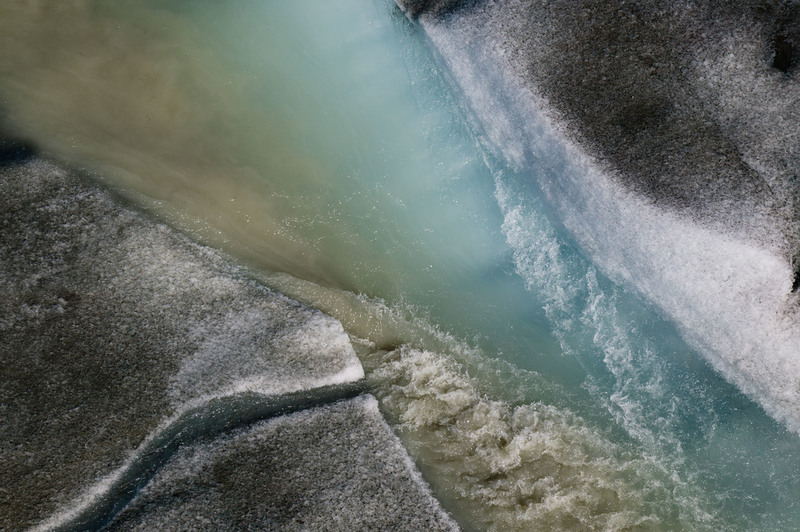 The fjord water (top) appears green and the meltwater pools (bottom) appears blue in this image, due to the difference in salt content and purity of the water.